What is NTFS USN journal? What happens when the NTFS USN change journal fills up? Let’s say two identical directories are created in different replication members, FRS identifies the conflict during replication, and the receiving member protects the original copy of the folder and renames (morphs) the later inbound copy of the folder. The morphed folder names have a suffix of “_NTFRS_xxxxxxxx,” where “xxxxxxxx” represents eight random hexadecimal digits. Till now we are discussing about the SYSVOL replication, how the SYSVOL replication works for the newly added replication partner, newly added replication member doesn’t have any updates, and it should build the folder structure from the beginning, this process is called vvjoin, in which a downstream partner joins with an upstream partner for the first time. Group Policy loopback is a computer configuration setting that enables different Group Policy user settings to apply based upon the computer from which logon occurs. When enabled, user settings from GPOs applied to the computer apply to the logged on user. Loopback processing changes the list of applicable GPOs and the order in which they apply to a user. Why would I use loopback processing? Administrators use loopback processing in kiosk, lab, and Terminal Server environments to provide a consistent user experience across all computers regardless of the GPOs linked to user’s OU. Our recommendation for loopback is similar to our recommendations for WMI filters, Block Inheritance and policy Enforcement; use them sparingly. All of these configuration options modify the default processing of policy and thus make your environment more complex to troubleshoot and maintain, whenever possible, keep your designs as simple as possible. The loopback setting is located under Computer Configuration/Administrative Templates/System/Group Policy in the Group Policy Management Editor (GPME). 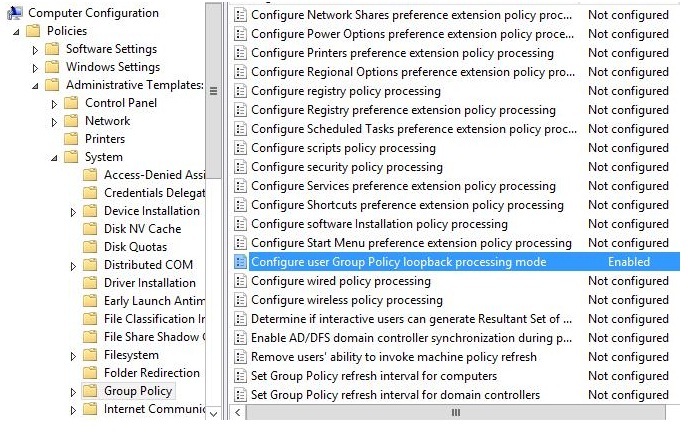 Use the policy setting Configure user Group Policy loopback processing mode to configure loopback in Windows 8 and Windows Server 2012. Earlier versions of Windows have the same policy setting under the name User Group Policy loopback processing mode. When you enable loopback processing, you also have to select the desired mode. There are two modes for loopback processing: Merge or Replace. Prior to the start of user policy processing, the Group Policy engine checks to see if loopback is enabled and, if so, in which mode. During loopback processing in merge mode, user GPOs process first (exactly as they do during normal policy processing), but with an additional step. Following normal user policy processing the Group Policy engine applies user settings from GPOs linked to the computer’s OU. The result– the user receives all user settings from GPOs applied to the user and all user settings from GPOs applied to the computer. The user settings from the computer’s GPOs win any conflicts since they apply last. Now, going back to our original example, loopback processing in Merge mode applies user settings from GPOs linked to the user’s OU followed by user settings from GPOs linked to the computer’s OU. Loopback replace is much easier. During loopback processing in replace mode, the user settings applied to the computer “replace” those applied to the user. In actuality, the Group Policy service skips the GPOs linked to the user’s OU. Group Policy effectively processes as if user object was in the OU of the computer rather than its current OU. The chart for loopback processing in replace mode shows that settings “1” and “2” do not apply since all user settings linked to the user’s OU are skipped when loopback is configured in replace mode. Returning to our example of the user in the “E” OU, loopback processing in replace mode skips normal user policy processing and only applies user settings from GPOs linked to the computer. 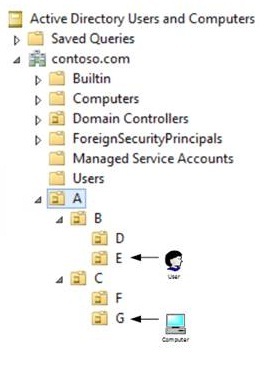 User Group Policy loopback processing is a computer configuration setting. Loopback processing is not specific to the GPO in which it is configured. If we think back to what an Administrative Template policy is, we know it is just configuring a registry value. 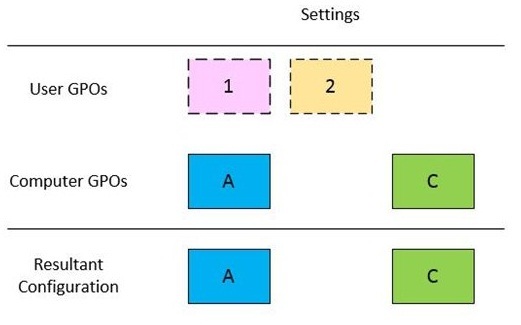 In the case of the loopback policy processing setting, once this registry setting is configured, the order and scope of user group policy processing for all users logging on to the computer is modified per the mode chosen: Merge or Replace. Merge mode applies GPOs linked to the user object first, followed by GPOs with user settings linked to the computer object. The order of processing determines the precedence. 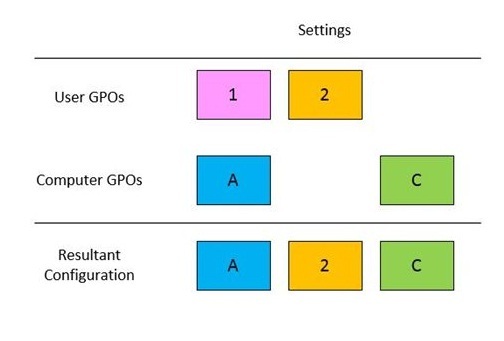 GPOs with users settings linked to the computer object apply last and therefore have a higher precedence than those linked to the user object. Use merge mode in scenarios where you need users to receive the settings they normally receive, but you want to customize or make changes to those settings when they logon to specific computers. Replace mode completely skips Group Policy objects linked in the path of the user and only applies user settings in GPOs linked in the path of the computer. Use replace mode when you need to disregard all GPOs that are linked in the path of the user object.